It all began during the Super Bowl. Some friends invited us to watch it at their house. When we got there we noticed a new pillow case. It was Star Wars themed. My husband teased them that they had made it for him and he really appreciated it. You see my husband has always been a Star Wars fan. 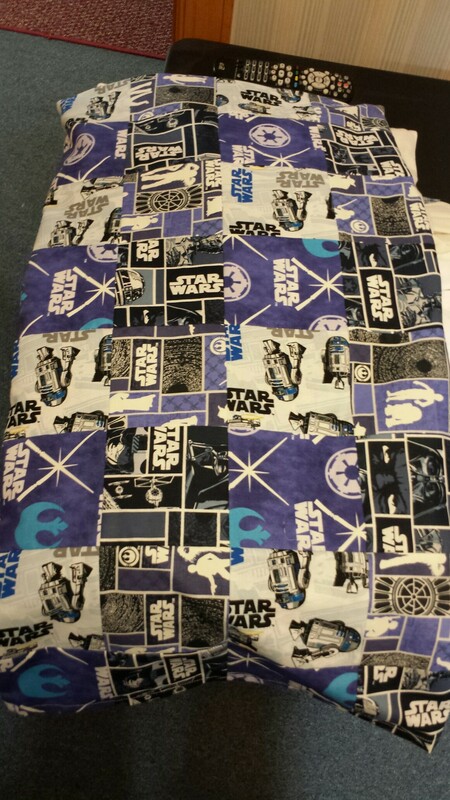 Well I was walking through Joann’s Fabric store buying material for a project when I saw the Star Wars material. There were several prints. I chose four prints that I liked and brought them home. I decided to I wanted to make something for my husband. It took a couple weeks before I got to it but once I did I had fun with it. I cut it up into pieces and patched them all together. I thought it was awesome. I sent pictures to my husband and then put it on the pillow. What makes it so awesome was the unexpected qualities of the pillow case. That night when we turned the light off it started glowing. So not only is it a Star Wars pillow case but it glows. So we rearranged the living room. My sewing desk was brought down as we’re my machines. My rolling cabinet was set beside it. We moved the computer desk into the nook in the master bedroom. 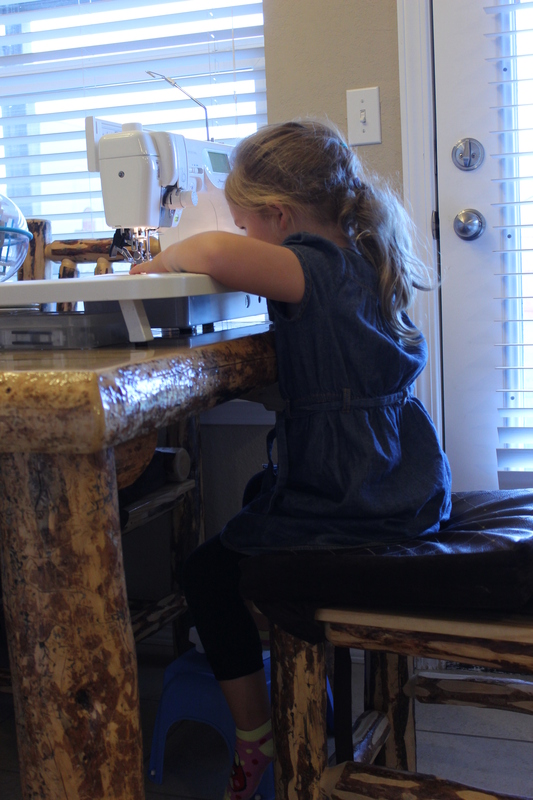 This way I can sew more while the kids are awake and use my serger during nap times. It has been great so far. I have spent the last two days serving what feels like ‘miles’ of fabric, getting it ready to ruffle. One. Ore day of this and I can start ruffling. We also moved our couches around so the living room looks larger and more organized. 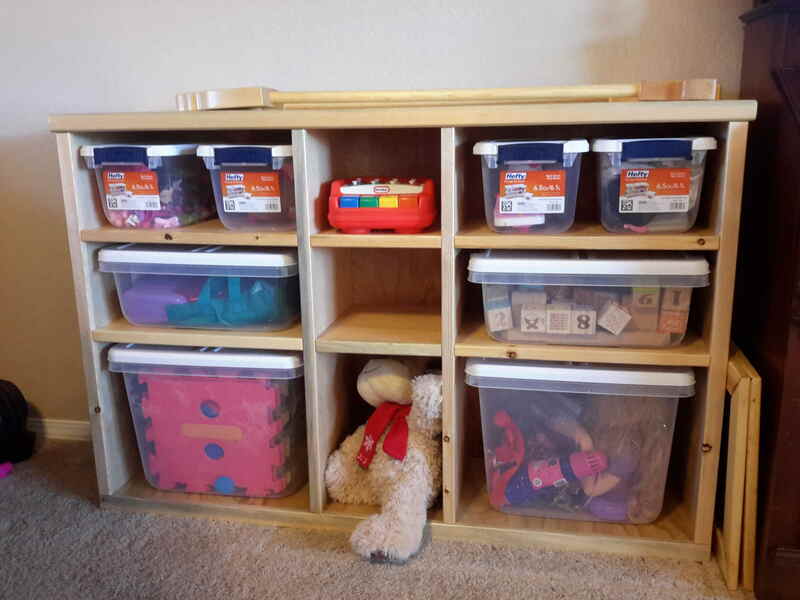 We did this partly because we made shelving units for the kids toys. Having moved couches it makes a better space for my trainer when I ride in the house at night. I’m no longer right in front of the TV but back a ways. So now that everything has been moved and the sewing stuff is now downstairs I am trying to catch up. I have several projects that need finished. They’ve been started but aren’t done. So nap time is here and kids are going down for nap time. You might be wondering what I finally did. Well I finally moved my sewing machine back down stairs to the kitchen table. That, I realize, doesn’t mean a whole lot to most people. Why would that be something to write about. Well I do have a sewing room and I am very grateful to have a room in this house dedicated to my sewing stuff (I have collected a lot of it), but I’m not getting any sewing done (and I have a lot of it). I’m running out of time and gaining more projects not narrowing them down to fewer projects. I like to give home-made gifts for birthdays and Christmas if I can and this year there are several that I can make. A couple are large and should have been started a few months ago so I could take my time sewing them rather than leaving it to the end and rushing through them. My sister-in-law recently told me that I should put some Christmas table runners in my store: IdahoAtHeart.etsy.com. My reply: I’d love to but it ain’t happening this year. I just haven’t had the time. I’m sure that you can understand. It’s Christmas time. We all have our responsibilities. We have our work, families, ourselves, our houses/homes, our friends and extended families and if we are married then we have our spouses work and so on and so forth. Something that I have known for a long time is that I am a procrastinator. I like many others put off and put off projects until the last-minute and then have to rush. I have learned a lot about myself in these rushing moments. For instance: I learned in October that I could free motion a king size quilt in one day. I had never free motioned an entire quilt of any size in one day but due to lack of time it had to be done. It pushes me to be better. I just need to learn to make time. It’s not that I don’t have time it’s that I don’t make the time. Having two of my three children at home during the day makes it hard to use my sewing room. There isn’t a lot for them to do upstairs because all the toys are downstairs. 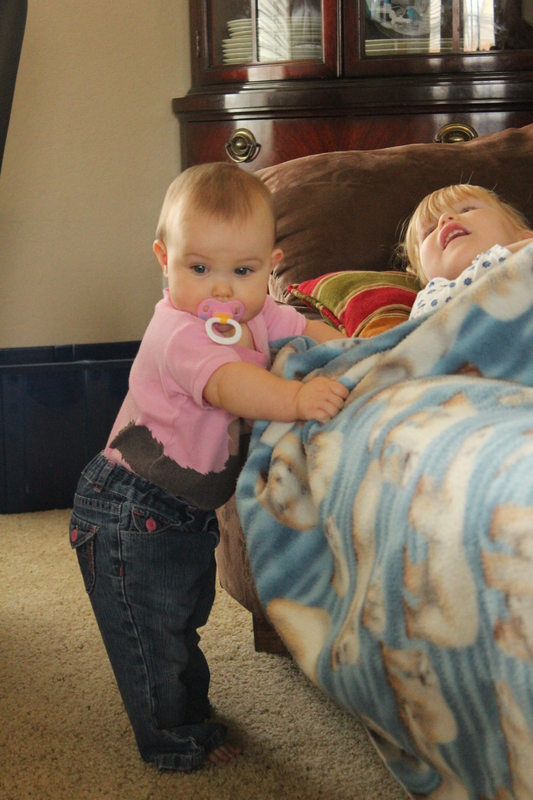 Despite the fact that they both take naps/rests each day – they don’t always take them at the same time. So in order to make the time I have once again relocated my sewing machine to the kitchen table so I can sew while my kids play. What are you procrastinating this holiday season? I love the hanging oven towels that my mother in law made for me. They come in so handy with children and just for me. I always know where the towel is. I don’t have to worry about pulling it off and it falling on the floor. I don’t have to worry about my kids running off with it and never finding it again (a bit of an exaggeration). That and they are just cute. This is an Owl themed hanging towel. I used a normal kitchen towel and a regular pot holder. I used a button that is about 1.25″ in diameter and because they are made of towels and pot holders they are durable and machine washable. I don’t have to worry about any special treatment. I throw them in my washing machine and then the dryer and then they do right back in the drawer or on the oven. One must crawl before you should walk. She might be walking before long and I’m not sure that I am ready. She crawls on everything. Well I decided to teach my oldest who is 5 1/2 year old how to sew. I got some good ideas off of Pinterest. I printed off mazes and connect the dots and stuff for her to practice with. She started with the maze. She loved it. We started with her sitting on my lap with me putting my foot on the pedal. Then I was so bored. Sorry to say but it was so slow. I set the speed at the slowest so she can get used to it. So, I started thinking about ways to get the pedal closer to her so she can do it herself. That would be ideal because she needs to be comfortable with all of it if she is going to sew. I grabbed the stool out of the bathroom and put the pedal on it. She was able to reach it and then was able to sew all by herself. She had a blast. The maze helped her work on going straight, starting and stopping, lifting up the foot and GENTLY putting the foot back down, and using the reverse once. We didn’t have the machine threaded so it just poked holes in the paper and she had a blast. 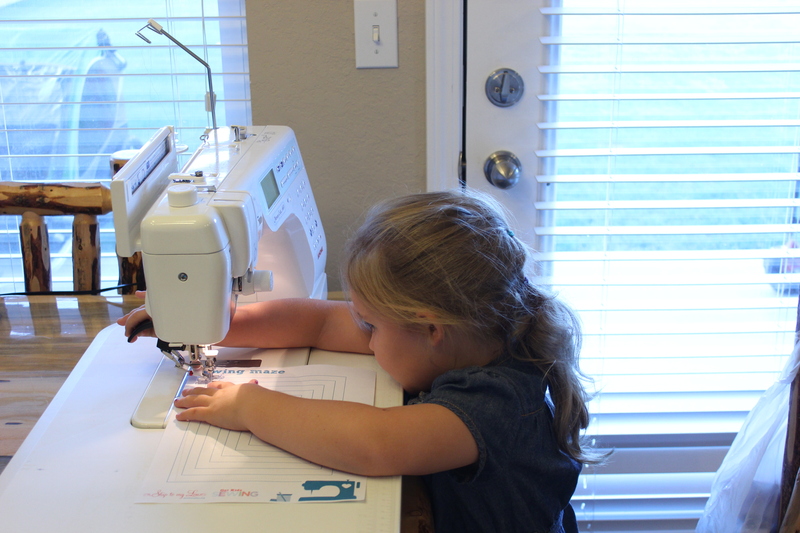 She keeps asking if she can sew again. I told her that my plan was to sew every Monday and Wednesday, work on our Russian Tuesday and Thursdays and Friday’s will be misc. She wants to learn to crochet. Who knows. It is just fun seeing her try new things.